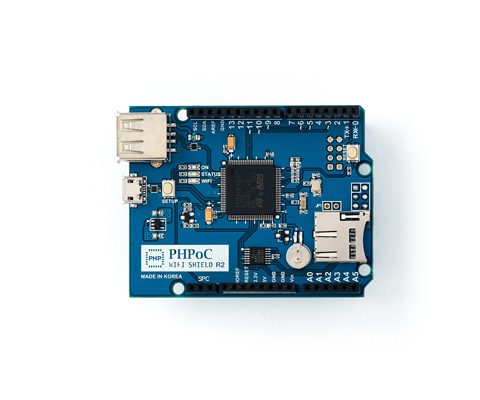 PHPoC WiFi Shield 2 (P4S-347 R2) is an advanced shield for Arduino, which connects Arduino Uno and Mega to the Internet. It brings many great features of PHPoC to Arduino, allowing users to create Arduino-powered IoT devices easily. PHPoC WiFi Shield 2 communicates with Arduino through SPI interface and connects to the Internet through WiFi. It supports various network and security protocols, adding plenty of capabilities to Arduino Uno and Mega. PHPoC WiFi Shield 2 is equipped with an embedded Web server, WebSocket server and a PHPoC interpreter, enabling users to create dynamic embedded web apps to real-time control and monitor sensors/devices. For users’ convenience, some web apps are built and preloaded into PHPoC WiFi Shield to help the users interact with Arduino easily via Web. Just by using the Web browser on your smartphone, tablet or PC, you can real-time control/monitor Arduino-connected things or change your network setting. PHPoC WiFi Shield 2, along with Smart Expansion Board for PHPoC shield, makes a great combination, which provides users many powerful functions to interact with other devices/sensors/actuators easily. If you need a similar product but for wired LAN connectivity, see PHPoC Shield 2 for Arduino.